A lustrous shell-pearl made with Sterling Silver Tahitian black pearl colour Perfect for every day wear, or special occasions Endlessly classic and wearable Suits all face shapes 9mm diameter ​Need help? Just send us an email! .. The Emily earring is a great affordable option for your bridesmaids or any other special occasion. A uniquely designed earring featuring a collection of mixed shape rhinestones. Very light weight, and suits all face shapes easily Can be matched with many of th..
Ultra-practical, super-pretty, and oh-so-versatile, the Mirabelle earring by Glamadonna deserves a place in everybody's jewelry box! Featuring genuine Swarovski Crystal, this simple stud earring works for daywear, date night, weekends and weddings. 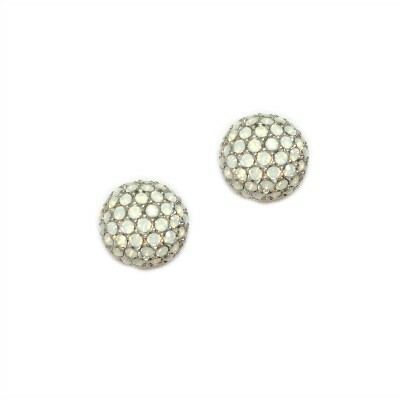 An affordable and thoughtful gift for your ..
A sparkling ball earring encrusted with genuine Swarovski Crystal. A versatile earring that you can wear for special occasions and daytime alike. Featuring a soft white crystal set into a silver plating. A slightly flattened back so the earring sits closer to the lobe. .. The Jade event earring is a bold and eye-catching design that's perfect for your modern wedding or other special event. Composed of a column of rhinestones set into an antique dark silver plating. Get the look of a statement earring without too much weight or bulk! Measures 5cms .. If you're looking for the perfect pair of bridal earrings to help you look and feel amazing on your wedding day or other special occasion, you've come to the right place! 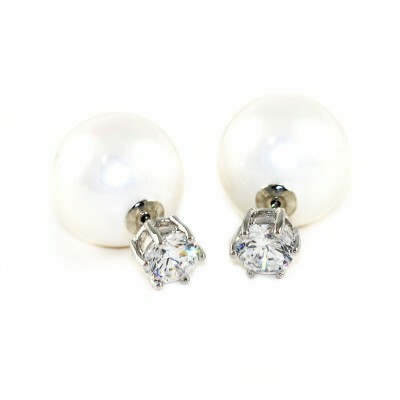 As our bridal earrings collection includes styles such as stud earrings, statement earrings, drop earrings, pearl drop earrings, pearl earrings and more. You'll discover that matching our bridal jewellery to your wedding dress or special occasion outfit is easy. You're assured of receiving a cherished keepsake you can keep for many years to come. All of our earrings are plated with lifetime platings and hypo-allergenic posts are standard. Our top quality cubic zirconia earrings and swarovski crystals will make you feel as if you're wearing real diamond bridal jewellery!